News about Empirica, algorithmic trading and software development. Who is moving FinTech forward in continental Europe? Thoughts after FinTech Forum on Tour. By Michal Rozanski, CEO at Empirica. In the very centre of Canary Wharf, London’s financial district, in a brand new EY building, a very interesting FinTech conference took place – FinTech Forum on Tour. The invitation-only conference targeted the most interesting startups from the investment area (InvestTech) from mainland Europe. The event had representative stakeholders from the entire financial ecosystem. As Efi Pylarinou noted – the regulator, the incumbents, the insurgents, and investors, were all represented. Empirica was invited to present its flagship product – Algorithmic Trading Platform, which is a tool professional investors use for building, testing and executing of algorithmic strategies. However, it was amazing to see what is happening in other areas of the investment industry. There were a lot of interesting presentations of companies transforming the FinTech industry in the areas of asset and wealth management, social trading and analytics. The conference was opened with a keynote speech by Anna Wallace from FCA. Anna talked about the mission of FCA’s Innovation Hub; that is to promote innovation and competition in the financial technology field and to ensure that rules and regulations are respected. Whilst listening to Anna it became clear to me what the real advantage of London holds in the race to become the global FinTech capital – London has Wall Street, Silicon Valley and the Government in one place – and what’s most important, they cooperate trying to push things forward in one direction. 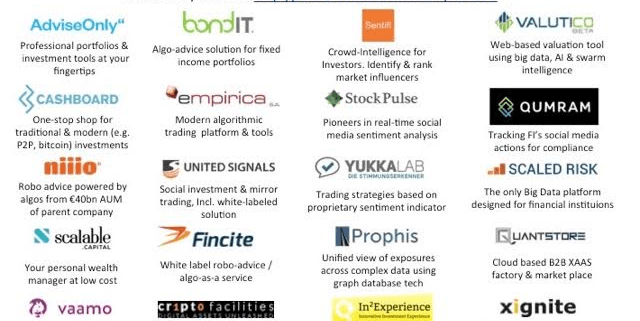 A short look at the companies presenting themselves at the event leads to the conclusion that the hottest sector of FinTech right now is robo-advisory. It’s so hot, that one of the panellists noted it’s getting harder and harder to differentiate for robo-advisory startups. On FinTech on Tour this sector was represented by AdviseOnly from Italy, In2experience, Niiio, Vaamo and Fincite – all from Germany. Ralf Heim from Fincite presented an interesting toolkit ‘algo as a service’ and white label robo-advisory solutions. Marko Modsching from niiio revealed the motivation of retail customers, that “they do not want to be rich, they do not want to be poor”. Scalable Capital stressed the role of risk management in its offering of robo advisory services. The social or sentiment analysis area, keeps growing and gains traction. Every day there’s more data and more trust in the results of backtesting as that data builds up over the years. The social media space is gaining ground. Investment funds as well as FinTech startups are finding new ways to use sentiment data for trading. And, it’s inseparably related with the analysis of huge amounts of data, so technically the systems behind it? are not trivial. Anders Bally gave an interesting presentation about how to deal with sentiment data and showed how his company Sentifi is identifying and ranking financial market influencers in social channels, and what they discuss. Sentitrade showed its sentiment engine for opinion mining that is using proprietary sentiment indicator and trend reversal signals. Sentitrade is concentrated on German-speaking markets. From the area of asset management an interesting pitch was given by Cashboard, offering alternative asset classes and preparing now for a huge TV marketing campaign . StockPluse showed how to combine information derived from social networks and base investment decisions on the overall sentiment. United Signals allows for social investing by making it possible to trade by copying transactions of chosen trading gurus with a proven track record, all in an automated way. And, finally BondIT, an Israeli company, presented tools for fixed income portfolio construction, optimization and rebalancing with use of algorithms. An interesting remark was given by one of the panelist: ‘we have nearly scratched the surface for what blockchain technology can be applied to in financial industry’. Looking at the latest news reports that are saying that big financial institutions are heavily investing in blockchain startups and their own research in this field, there is definitely something in it. A company from this sector of FinTech – Crypto Facilities, represented by its CEO Timo Schaefer, showed the functionalities of its bitcoin derivatives trading platform. Hervé Bonazzi, CEO of Scaled Risk, presented its technologically advanced Big Data platform for financial institutions for risk management, compliance, analytics and fraud detection. Using Hadoop under the hood and low latency processing. Ambitious as it sounds. Analysis of financial data for company valuations, Valutico presented a tool that’s using big data, AI and swarm intelligence. Dorothee Fuhrmann from Prophis Technologies (UK) presented a generic tool for financial institutions to derive value and insights from data, interestingly describing indirect exposures and a hidden transmission mechanism. Stephen Dubois showed what Xignite (US) has to offer to financial institutions and other FinTech startups in the area of real-time and historical data that is stored in the cloud and accessible by proprietary API. Qumram, in an energetic presentation delivered by Mathias Wegmueller, described technology for recording online sessions on web, mobile and social channels, allowing for the analysis of user behaviour and strengthening internal security policy. London is the place to be for FinTech startups. No city in Europe gives such possibilities. Tax deductions for investors. Direct help from the UK regulator FCA. Great choice of incubators and bootcamps for startups. No place gives such a kick. Maybe Silicon Valley is the best place for finding investor for a startup, maybe the Wall Street is the centre of the financial world, but London is the place that combines both the tech and the finance. It has a real chance of becoming the FinTech capital of the world. The people responsible for creating both a great and professional atmosphere at the event were Samarth Shekhar and Michael Mellinghoff. Michael was a great mentor of mine who transformed my pitch from a long and quite boring list of functionalities of our product to something that was bearable for the audience. Michael let me thank you once more for the time and energy you have devoted to Empirica’s pitch! And because the FinTech scene in our region is not well organized yet, I sincerely advise all FinTech startups from Central and Eastern Europe to attend cyclic events of FinTech Forum in Frankfurt organized by Techfluence professionals! Read about our Lessons learned from FinTech software projects. http://empirica.io/wp-content/uploads/2015/10/CanaryWharf-FinTech.jpg 1118 1912 empirica http://empirica.io/wp-content/uploads/2019/02/Logo_empirica_software-for-financial-markets_final.png empirica2015-10-02 20:50:242016-06-06 18:37:41Who is moving FinTech forward in continental Europe? Thoughts after FinTech Forum on Tour. Empirica has been nominated for the Best Fintech Startup in Poland at the CESA festival. CESA (Central European Startup Award) is the biggest no-pitch, no-conference start-up festival in the Central-Eastern European region. The festival brings together nearly 4.000 start-ups from 10 countries and it will be held in Vienna this year. CESA regognized FinTech as separate category this year reflecting that financial technologies are now the fastest growing technology sector worldwide. Incumbents in the financial industry – big banks and other financial institutions – are witnessing the emergence of new players that are profoundly changing the way individuals and business conduct their financial operations. Global investment in financial-technology (fintech) ventures tripled from $4.05 billion in 2013 to $12.2 billion in 2014, with Europe being the fastest growing region in the world, according to a report by Accenture. Last year, fintech investment increased at more than three times the rate of overall venture capital investment. While it remains to be seen whether the burgeoning fintech industry will actually pose a threat to established institutions, it is clear that the sector is rapidly growing and many of these entrants are here to stay. Investors in the nascent sector are taking notice, profitable exits are on the horizon, and big banks are investing in new technologies to strengthen their competitive positions.